How do you choose which brand of kibble to get, or do you want to feed raw. Whatever you choose, the most important thing is that your dog eats it and stays in perfect health. Our dogs start their day with a meal of KVV. This means they get raw meat that is processed and frozen. We started to feed this a few years ago, when friends told us they had very positive results with the coats and smells of their dogs. Especially Raiko with his skin/hair condition benefits from eating meat without all the extra’s they put in kibble. We feed as much different animals and brands as possible, to make sure they get everything they need. If you want to know more about KVV or where to buy this, we highly recomment Gunshies located in Beverwijk, Holland. The owner really knows what she is talking about. At night we choose to feed our dogs kibble. We feed them Bozita, this is a Swedish brand which is hard to get in the Netherlands at this point. Just a few stores sell it and one of them is Gunshies. We’ve got a very good experience feeding Bozita, but this might not be the case for you or your dog. Just make sure you and your dog are happy with what your are feeding. If you want to switch brands, please follow the right scheme and do not switch all at once because your dog can get very sick. What does Bozita say about their food. 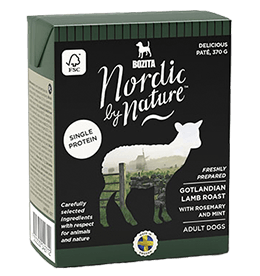 Bozitas dog products are available in three different brands, made in Sweden and produced with as much Swedish ingredients as possible. Sweden is famous for its healthiness, pure nature, high quality products and high animal protection standards. We are proud of our Swedish heritage, which can be seen in our products. We take pride in cooking dog food with natural ingredients and no unnecessary additives. So when you serve Bozita Naturals – you serve pure quality and nothing else. Our food is made from responsibly sourced ingredients, that’s not only great tasting and good for your dog, but also respectful to our planet and all animals. Our kitchen runs completely on energy from renewable resources, and all our packaging is made by recyclable materials to create a sustainable product chain. We have created a wide range of dry food products, with meat from fresh Swedish chicken and lamb. With kibbles in different sizes and varieties such as Senior, Light and Puppy & Junior, there is a product for every dog based on who they are and their life stage. Our tasty wet food comes in Tetra Recart® packages with chunks in jelly and cans with delicious pâté. They only contain ingredients of high quality – no grain, soy or colorants. You can serve your dog a variety of flavours like chicken, reindeer and turkey, either as a full meal or mixed with our dry food. Made with natural ingredients and no unnecessary additives. Made with love under world-class Swedish animal protection laws. Sustainable production and a respectful process.